In a way, our visit to Bulgaria resembles the philosophy of and our expectations towards this overland journey. We decided to go there less than 24 hours before we crossed the border. 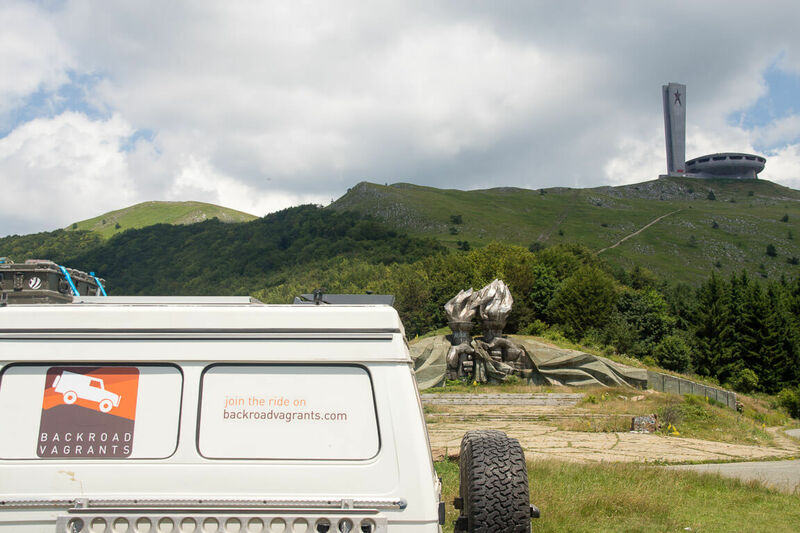 And actually, we had planned to drive into Bulgaria for only one reason: We needed an affordable campground where we could do some laundry and work on our blog for a couple of days. Something we had not been able to find anywhere close by in Greece or Turkey. After the work was done, we decided to do a one day sightseeing trip as well. We could not have taken a better decision. 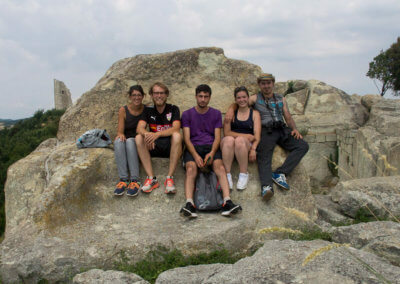 It was a great day, we met nice Bulgarians and visited one of the coolest monuments in the world! 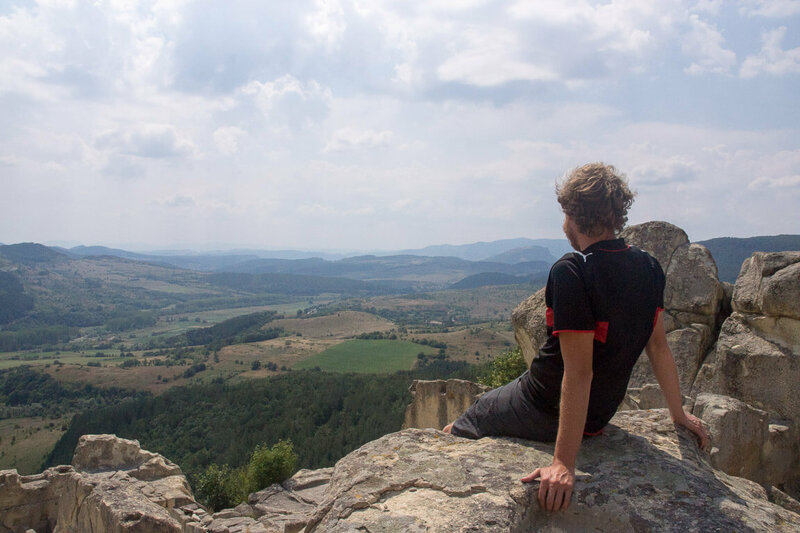 During our wonderful stay at Sakar Hills Camping, Heiner searched the web for nearby sights in Bulgaria. 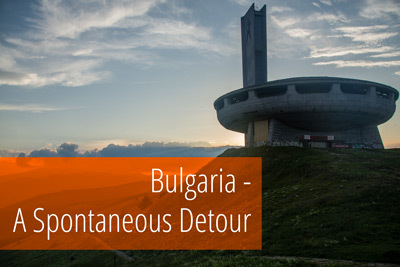 Most things were just too much of a detour on our way to Istanbul. 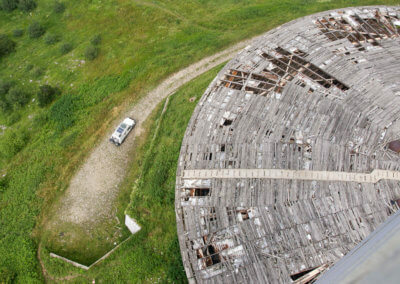 But when he saw pictures of the Buzludzha Monument, he wanted to go there really bad. 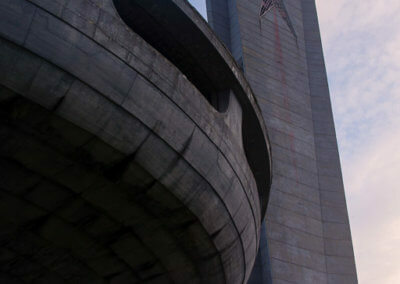 It is Bulgaria’s communist party’s main monument. 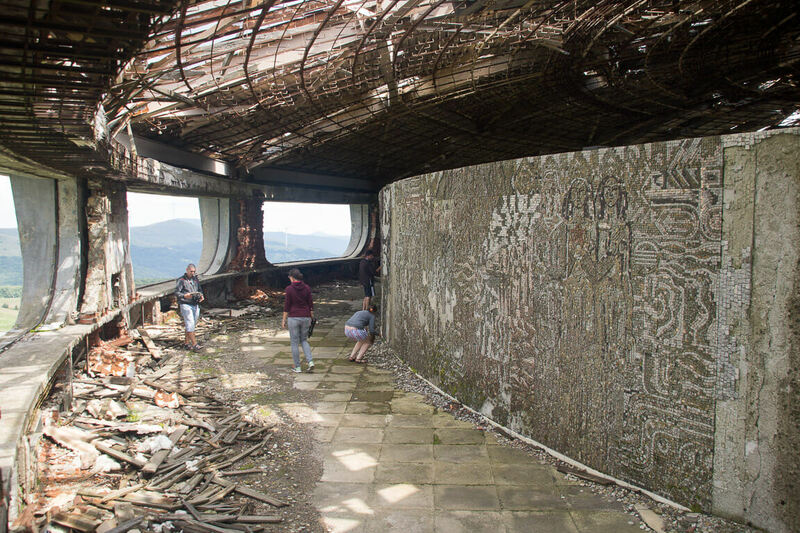 A great example for Brutalist architecture in a mountaintop setting, left abandoned for almost 30 years. 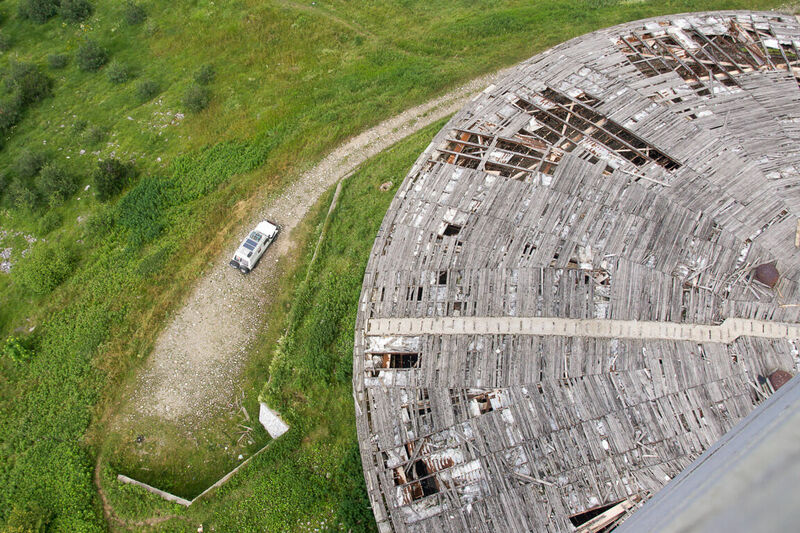 What a great place to explore and, more sadly, also a sight that – if nothing changes – will not be around much longer. A view we could not resist. It was not hard to convince Anna with a couple of pictures found online. 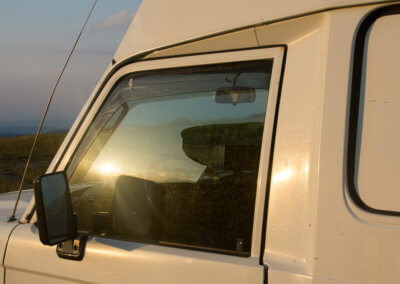 Plus, what is a 400 km detour on the way to Australia? 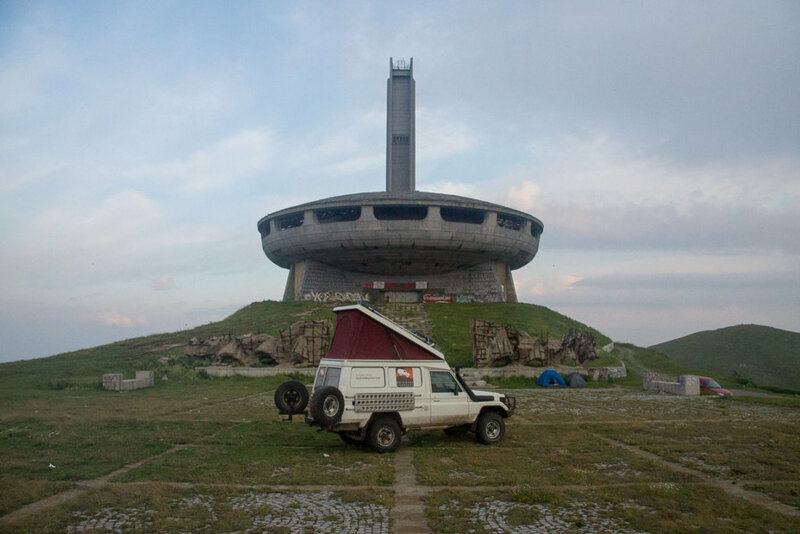 So we stocked up on fuel and groceries and left for Buzludzha. 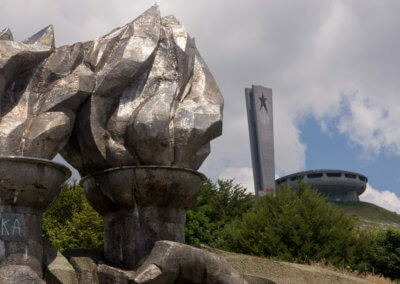 Unlike in many other ex-communist countries, the communist regime in Bulgaria did not collapse under the anger and hate of the people. 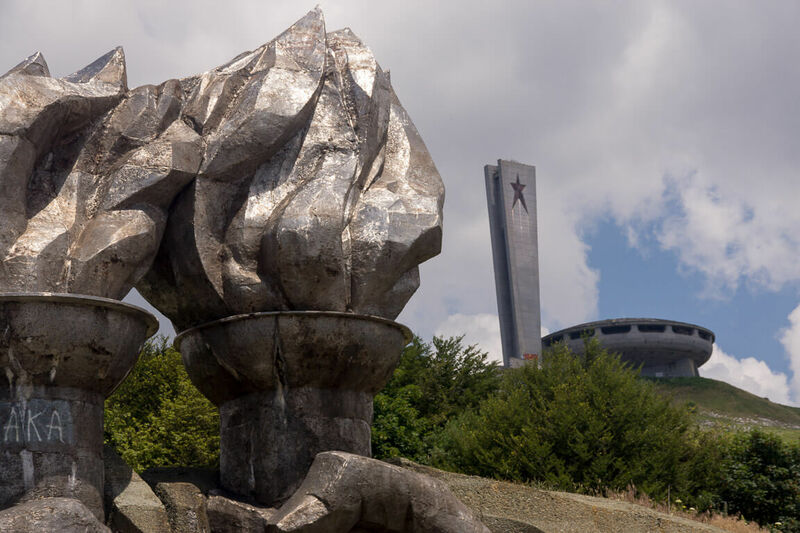 Even today, negative memories about the communist days do not necessarily prevail and there is quite some nostalgia going on. 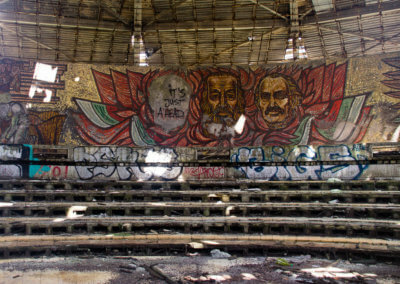 A good indicator are the number of communist monuments that are still spread all across the country. 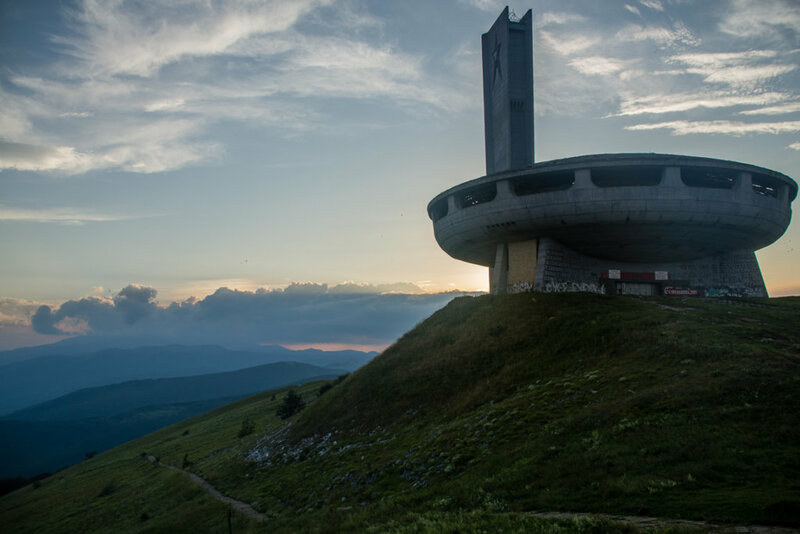 Buzludzha is the biggest and most beautiful, but you can find monuments and statues in almost any town. We found a good example on our way to Buzludzha. 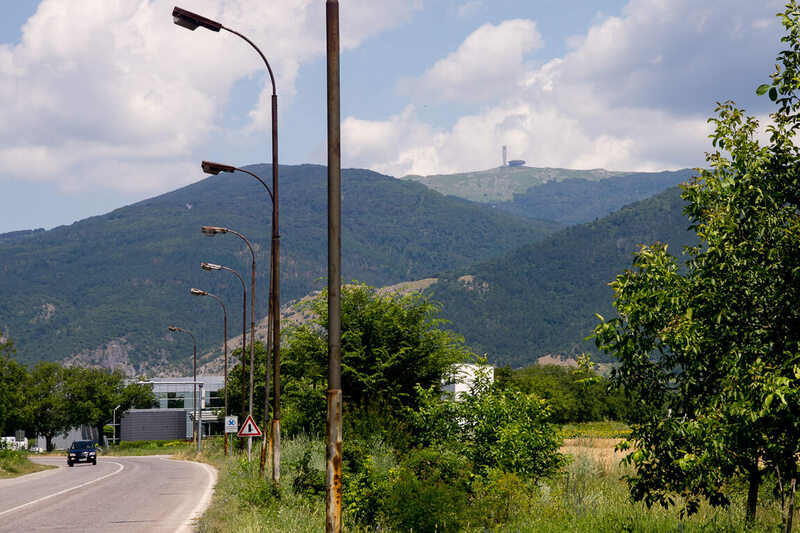 We passed the city of Stara Zagora, where the Samarsko Zname Monument is well visible from the ring road in several kilometers distance. So we stopped for some pictures. 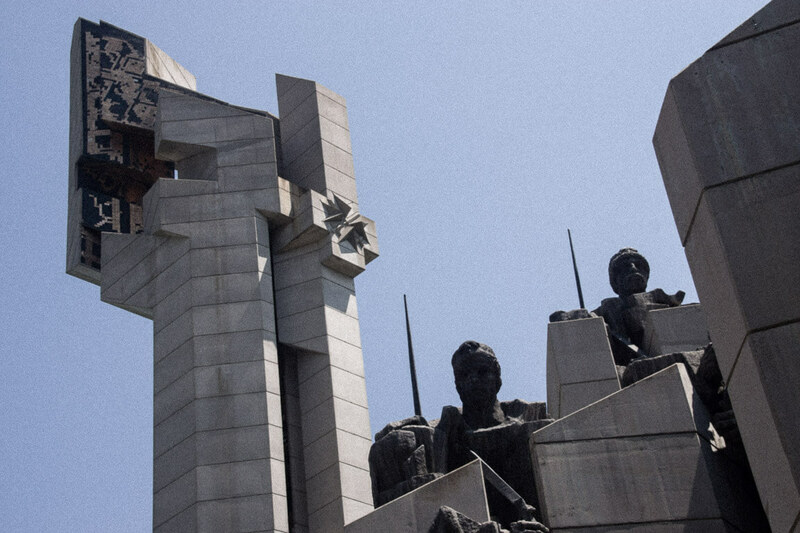 And we have to admit, this monument clearly fulfills its task! You feel very small climbing the huge staircase. It does not get better once you reach the top, where the tower and statues are. 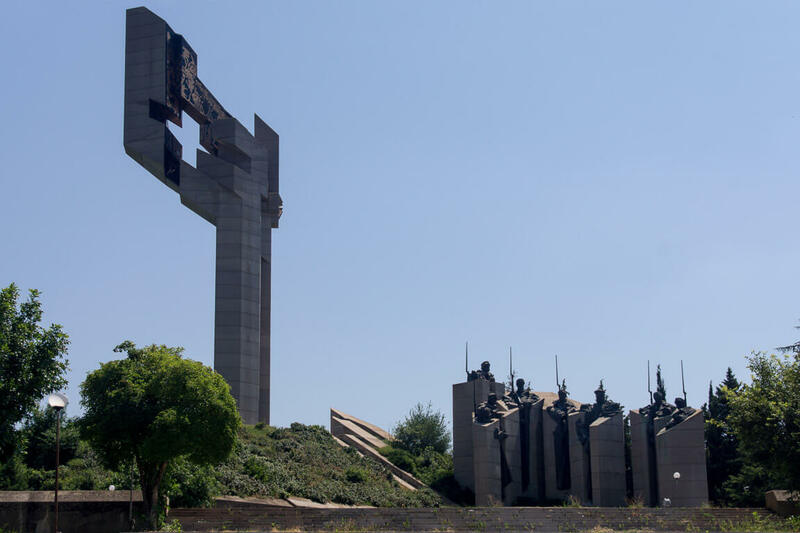 Standing at the soldiers’ feet, you feel a strong urge to salute these ten meters tall comrades who have given their lives in the Russo-Turkish War. 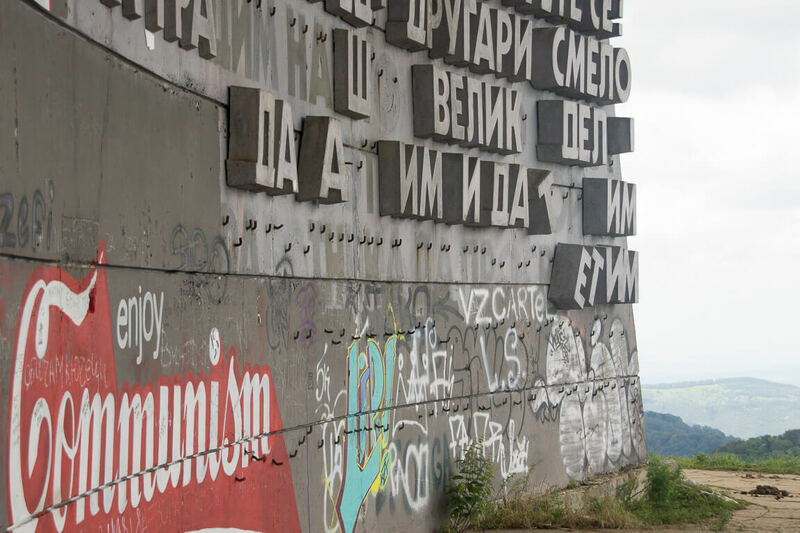 After a short drive, Buzludzha came into sight. 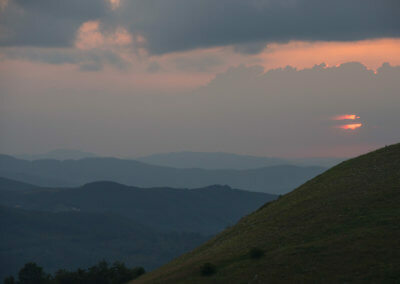 Because of its location and its enormous size, you can see it more than half an hour before you actually get there. 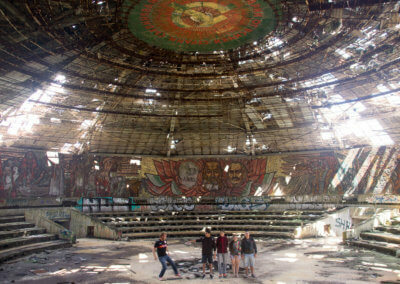 It consists of a circular assembly hall with a diameter of 60 meters and a 70 meters high tower next to that. 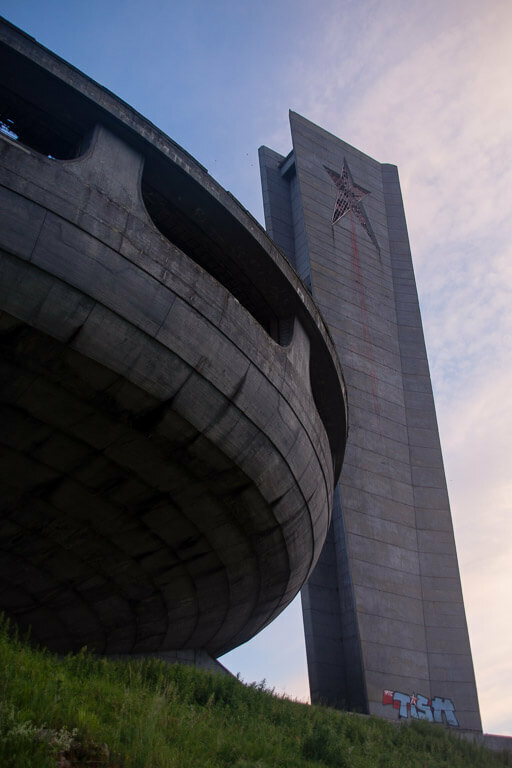 It was opened in 1981 and mainly used during the commemorations of the founding of the communist party which takes place every year around August 1st. 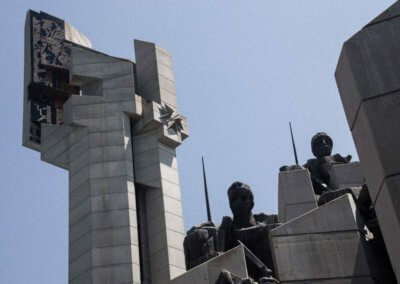 And even nowadays, more than 30,000 people commemorate this day here every year. Checking out the exterior, we ran into three young Bulgarians from Sofia. They immediately offered to enter the building with us. We agreed and began searching for the entrance. 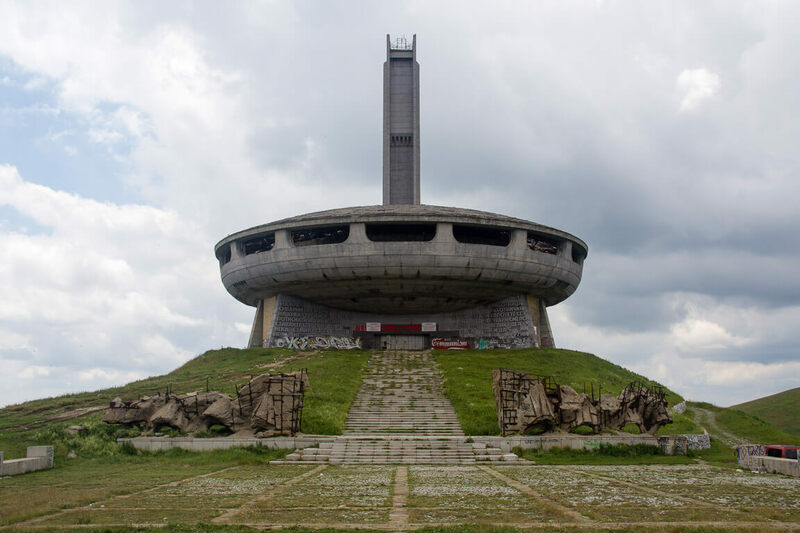 The main entrance was locked by Bulgarian officials a couple of years back. As you can see in the pictures, the roof is falling apart. Of course, they do not want to be liable for anybody getting hurt on state property. So they locked the doors and put up some signs. Job done. On the other hand, they do not really care. 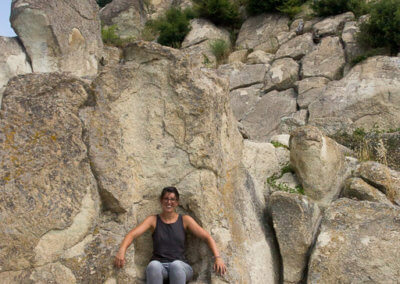 So there is a well established entrance, that involves some climbing and makes you feel like you have earned it. After a a short walk through the basement we reached the former entrance hall. It is really hard to imagine how this must have looked like before. Weather and vandals have left deep wounds. This does not hold for the main assembly hall we reached after climbing one of the three staircases. There is still a fair share of marble and the 360° mosaic left. 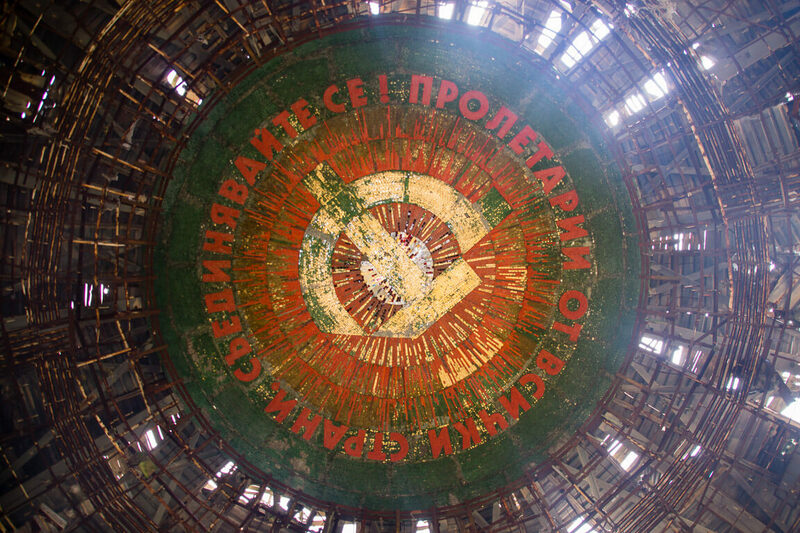 A hammer and sickle ceiling mosaic adorns the center of the dome. 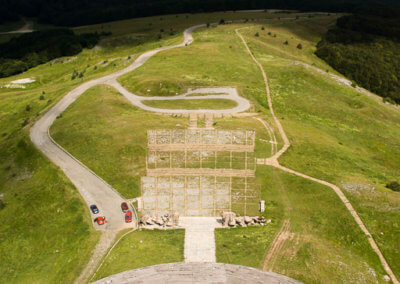 We spent minutes in silence, imagining how it must have looked and felt like, attending one of the ceremonies that were held here. A few more steps and we reached the gallery area with more mosaics on one and great mountain views on the other side. 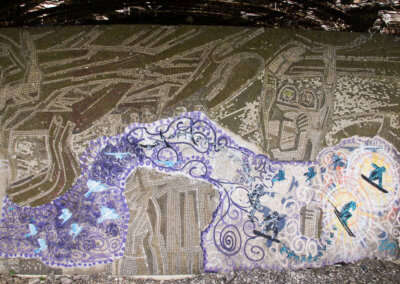 Dozens of artist made those grand mosaics. It took them 18 months. 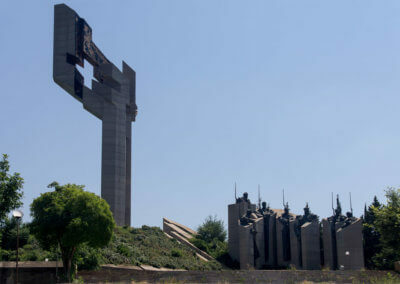 The construction of the whole monument was carried out over more than seven years and US$ 7 million had been spent. 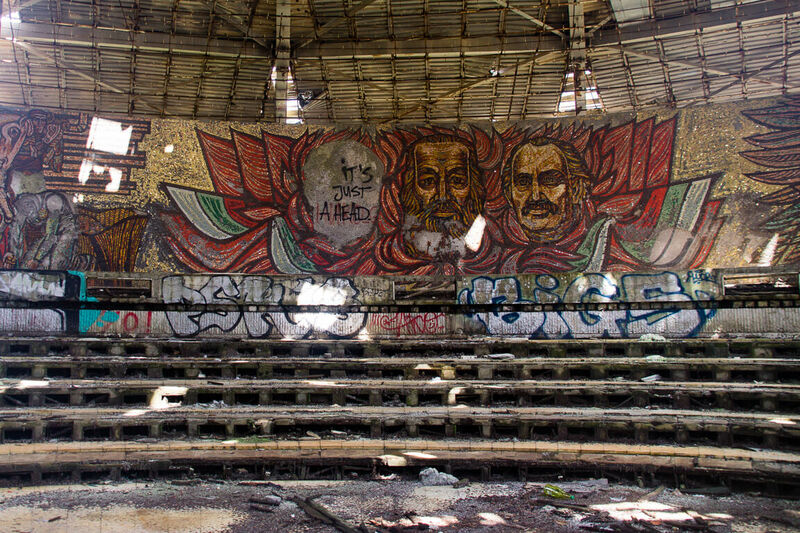 We can only hope that somebody takes responsibility for this great building soon to save it from total decay. 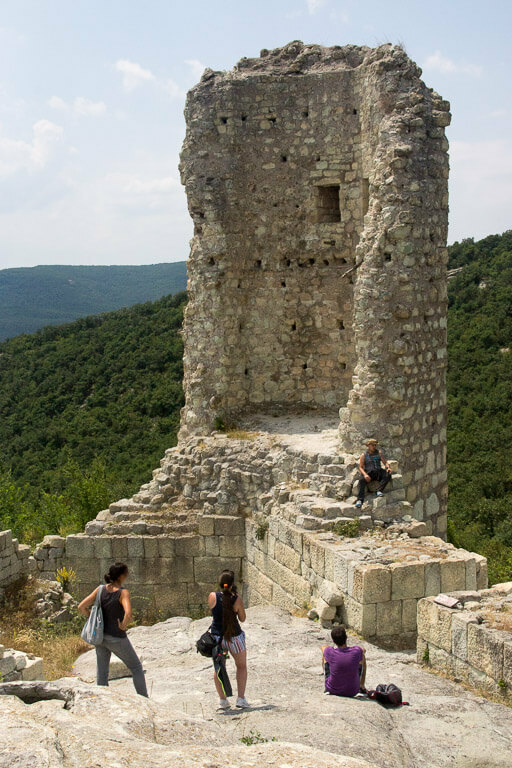 As if the interior was not enough, there is also the tower. We climbed the steep and narrow steps made of steel. Almost at the top we left the dark staircase, lit only by our head lights, and entered a larger room. Three or four storeys high. 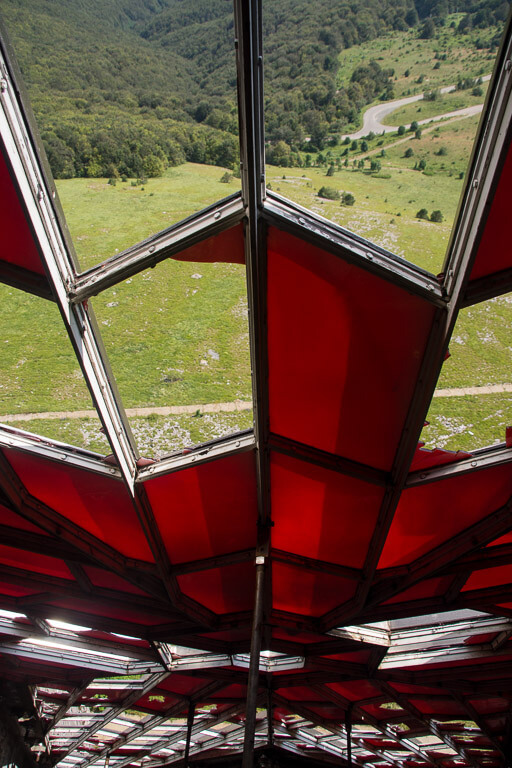 Light is shining through the remaining glass panels of the huge red stars. 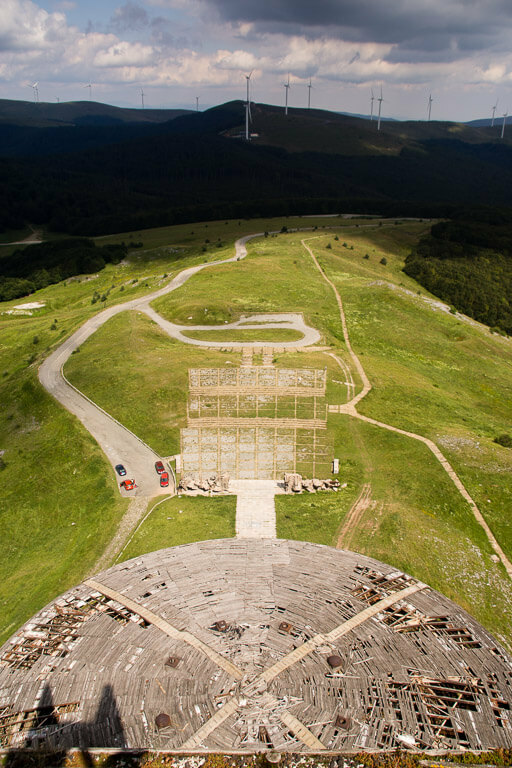 The missing panels gave vision to the ground far below us. Just a few more steps and we reached the top. 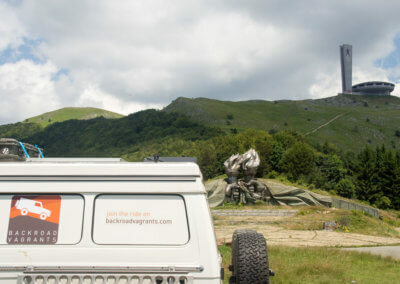 More great views of the surrounding landscape and the monument itself were waiting for us there. The five of us started to talk while we stood there at the top of the tower, recovering from the climb. 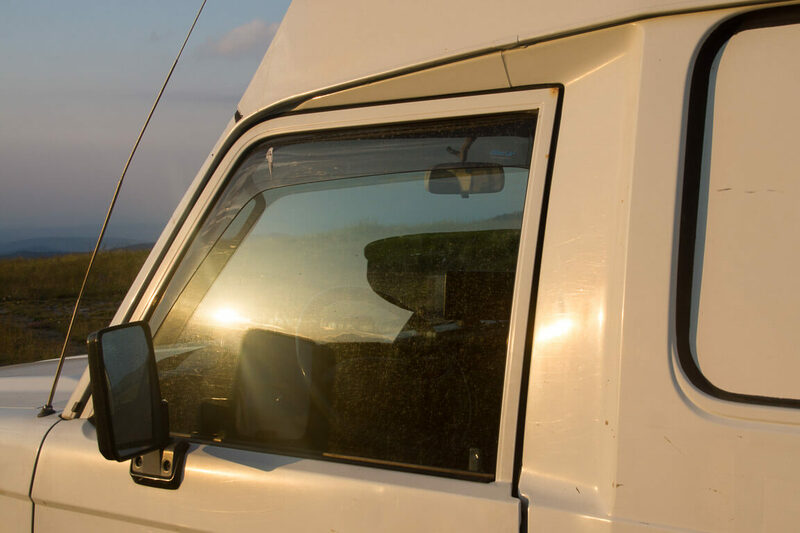 We found out, that our three new friends were on a cross country road trip. That night, they were planning to camp at the monument. After we had descended and left the monument, we saw that they were serious about that. They pitched their tents right in front of what was once a sculpture of a waving red flag. Just a couple of steps from the main entrance. More or less as close to the monument as you could possibly pitch a tent. Yep, we camped right in front of the entrance. What a cool place to camp, we thought. 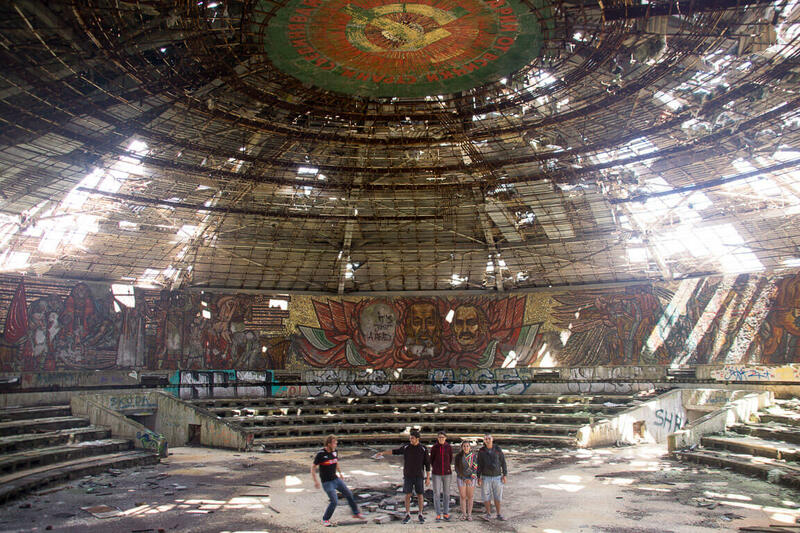 So we joined them and parked Willie right in the middle of the big square in front of Buzludzha. What followed were hours filled with tasty Bulgarian homemade food and liquor, talk and laughter. 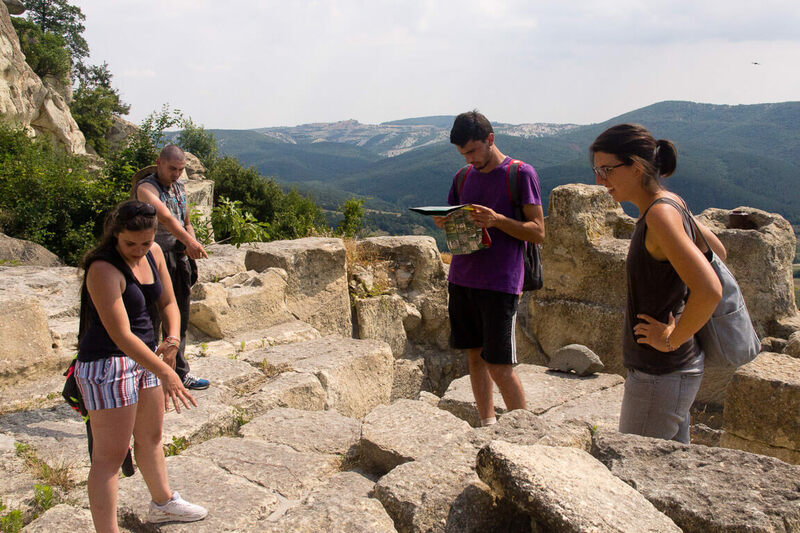 They also invited us to join them on their visit to the archaeological site of Perperikon, the next day. 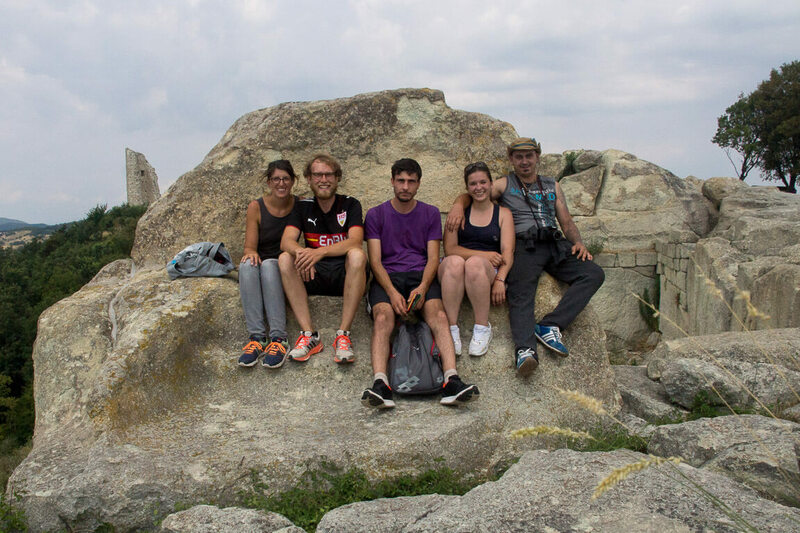 Since we liked their company and Perperikon was almost on our way to the border with Turkey, we agreed. Willie, the Torch and the main monument. View towards the main entrance. 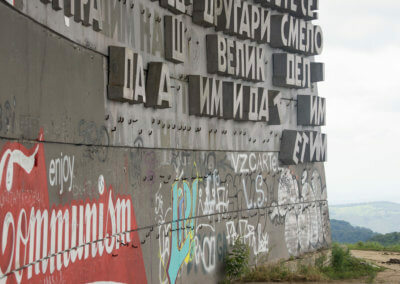 Excerpts from "The Internationale" written in concrete letters flank the main entrance. Some helpful person wrote down the word "entry" to lead your way. 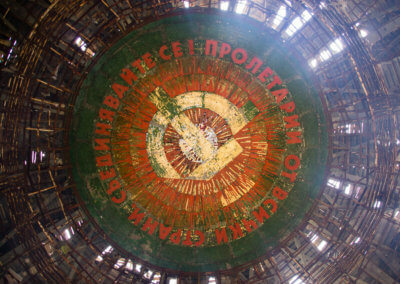 "Proletarians of all nations unite" is what the ceiling mosaic says. They did not. 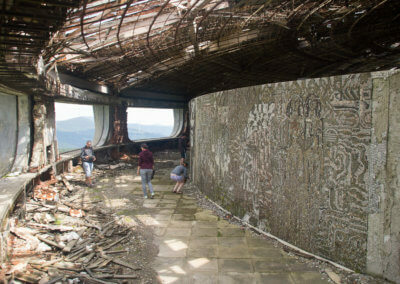 The gallery offers grand mosaics on one side and mountain views on the other. 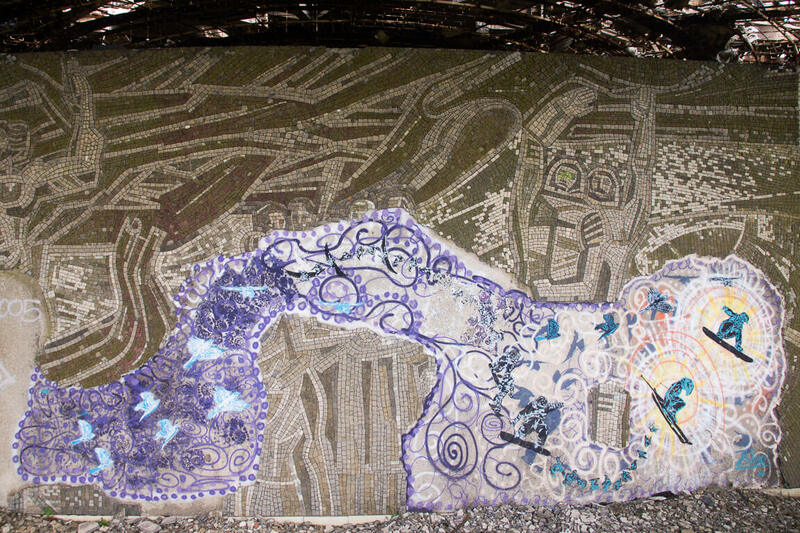 Many mosaics were severely damaged from souvenir hunters. This one was filled in nicely. 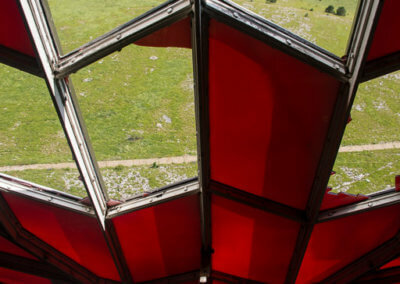 Look through the tower's red star. The roof is in a very bad shape. Willie is watching our backs. 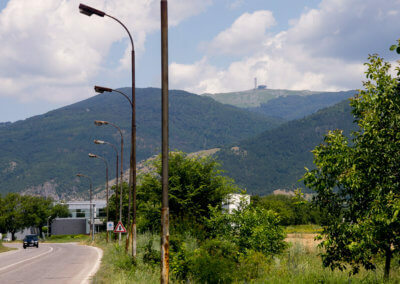 Monument, the big square and mountains. Even its reflection looks cool. Five hours of sleep had to suffice and we hit the road at 7 am. 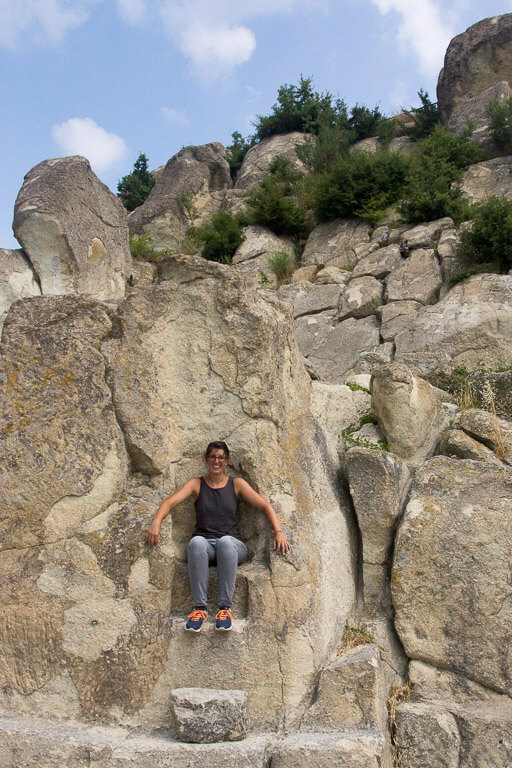 About three hours and two coffee breaks later, we arrived at Perperikon. 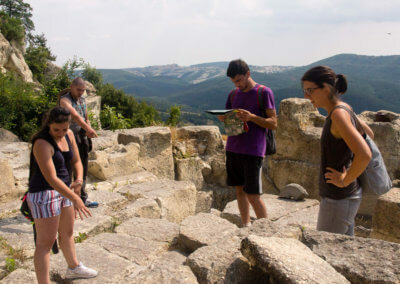 There, we found an archaeological site that is refreshingly different to what we had seen in Greece. Excavations have just begun in 2000 and research is still underway to uncover the rest of the yet undiscovered area. And although there are not many great structures on display, it is quite easy to get a feeling of how this ancient city must have looked like. Perperikon is not just about the excavations, it is also in a very nice setting! 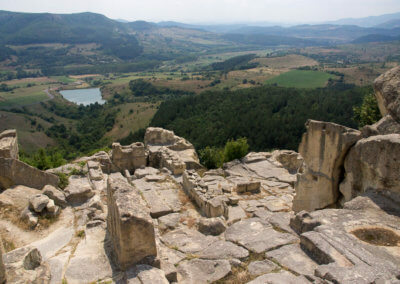 The fortress' tower is the largest structure visible at the site. Our personal guides showed us around and we all had a good time. But that day was also match-day for Germany in the EURO 2016 and we wanted to arrive in Istanbul on time to watch the game. Therefore, we needed to hit the road around noon. So we had to say goodbye. Hoping that, one day, our paths will cross again. We can just state here one more time: it was great meeting you, guys! Thanks again for showing us around! 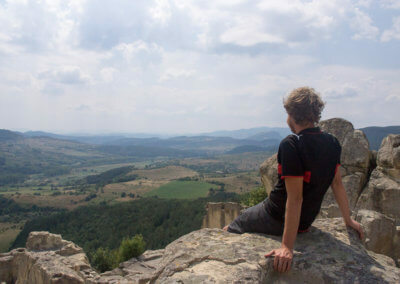 We enjoyed Bulgaria!